Giant sequoias are one of the endemic species — those growing only in California — that have researchers worried as their local habitats are affected by climate change. The research, led by UCLA professor Jon Christensen, also showed significantly less movement by species that grow only in California, suggesting that these endemic species may have the hardest time adapting to the challenges of climate change. 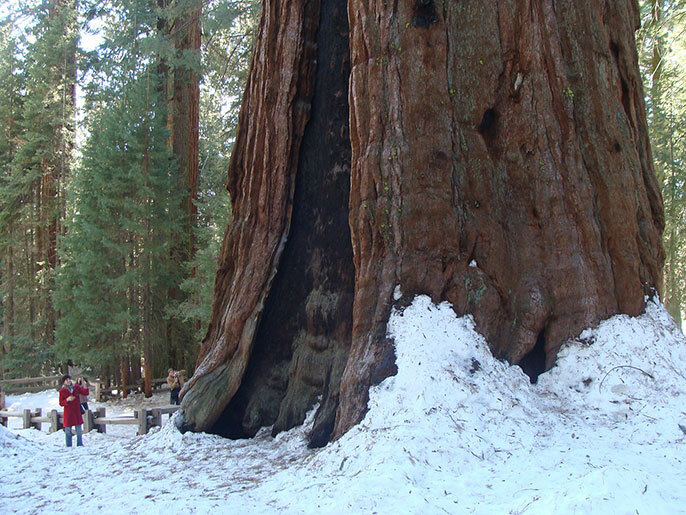 It’s concerning that some endemic species, like giant sequoias, and many native species, like redwoods, show little to no sign of shifting as their local habitats change, the researchers said. Their analysis showed that 15 percent of plant species in California are creeping higher. However, 27 percent of non-native species are on the move, compared to 15 percent of native species and just 12 percent of endemic species, according to their study, “Altitudinal shifts of the native and introduced flora of California in the context of 20th-century warming,” which appeared Jan. 22 in the journal of Global Ecology and Biogeography. The researchers analyzed 682,000 specimen records of the 4,426 species present in California, making this the most comprehensive study of its kind. They compared what elevation ranges individual species used to grow at against where they grow now. The study is also unusual for being an empirical study of where plants have been found and are found, rather than a model of where plants may move in the future. On average, the plants that shifted their range moved upward by 13 meters, and there were significant elevation changes in a smaller percentage of plant species than other studies have observed in birds and mammals — another potential indication that ecosystems are pulling apart. The study samples were collected in California from 1895–2009 and digitized by the UC Consortium of California Herbaria. Many of the samples were collected over the past century by UC scientists. Correcting for sampling bias helped researchers track the migration of the sticky monkey flower. One challenge for the researchers was eliminating biases by the various collectors, whose sampling choices were influenced by the different scientific questions they set out to answer. Previous researchers have tried to analyze similar types of historical data but failed to obtain usable results, and the team was warned not to try, Christensen said. For instance, botanists tended to collect near roads; certain geographic areas received more attention than others; and some plants were collected more often at lower altitudes over time, despite growing concerns that species might increasingly be moving to higher altitudes, Christensen said. Lead author Adam Wolf — the founder of Arable, an agriculture and natural-resource monitoring startup, formerly with Princeton University’s department of ecology and evolutionary biology — developed a new statistical method to analyze the data while filtering out the introduced bias, a method that could be used by other researchers delving into similar historical records, the researchers said. The sticky monkey flower initially appeared to move downslope in the unfiltered data, said Christensen, who works with the UC-wide Institute for the Study of Ecological and Evolutionary Climate Impacts, which is using the 39 natural reserves in the UC system as a network for studying climate change and ecosystems in California.